Welcome to your new Liberal government Canada! 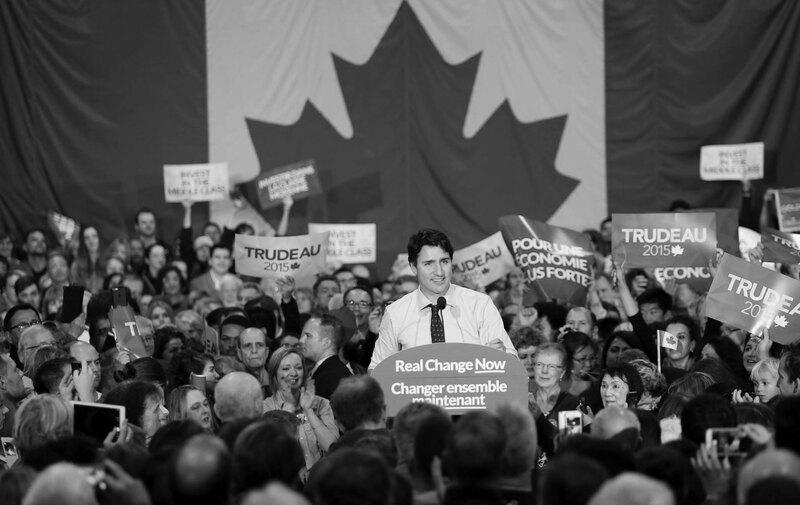 After 10 years of Conservative power, Canada has called for transformation. A slow (and unpredictable) shifting of political alignments and an overall readiness for change could be felt in small tremors throughout the country over the past year or so. Maybe Canada wasn’t too shocked… after all social media feeds have been swarmed with articles and statuses from unhappy Canadians. But it’s hard to make clear speculations from the blue skies in Alberta where there were many shows of support for Mr. Harper. On Oct. 19, Canada voted. In fact more Canadian’s voted then they have in over 20 years. Justin Trudeau is Canada’s 23rd Prime Minister and with twinkling eyes and a charismatic grin, he thanked voters for trusting him and his platform for change. Change indeed. Not only do we have a new leader, but we have a Liberal majority government elected with 184 seats in the House of Commons. Between the trans-Pacific Partnership, the controversial niqab debate and the possibility of economic recession looming around the corner, the historically long election campaign was intense and at times quite heated. In August, it looked like the NDP were the big competitors for Stephen Harper but somewhere amongst fiery debates and platform releases, the NDP seemed to lose the confidence of many voters. Mr. Trudeau, with his charisma and overarching theme of progress and modernity uprooted predicted voter patterns. Before we start speculating on Trudeau’s qualifications to run the country; our attention should be drawn to another historic change right here in YYC. After 68 years without a win, Liberals have won two seats in Calgary. For the most part, the Conservatives have maintained a stronghold in Alberta, but Darshan Kang won a Liberal seat in Calgary Skyview and Kent Hehr, who stopped by Mount Royal a few weeks ago, battled it out with Conservative candidate Joan Crockatt and won the Calgary Centre riding. Mount Royal, that’s YOUR riding! History happened last night, and if you voted, then you were a part of it. Lets now use our democracy to vocalize our opinions, but with the respect and courtesy that we are known for as Canadians. Let’s look forward to a future with a Prime Minister who will hopefully practice an honest government that balances the interests of the East and West. Congratulations on choosing to vote, regardless of who it was for! This is the true beauty of democracy, our ability to create change or voice our disagreement with change that occurs. Next story Is Everybody’s Blood in them to Give?